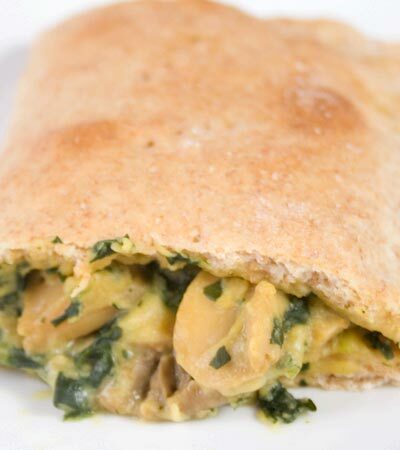 Inside, spinach and mushrooms mixed with a cheese-like sauce. Outside, a delicious and biscuit-y crust. Mmmmmm. 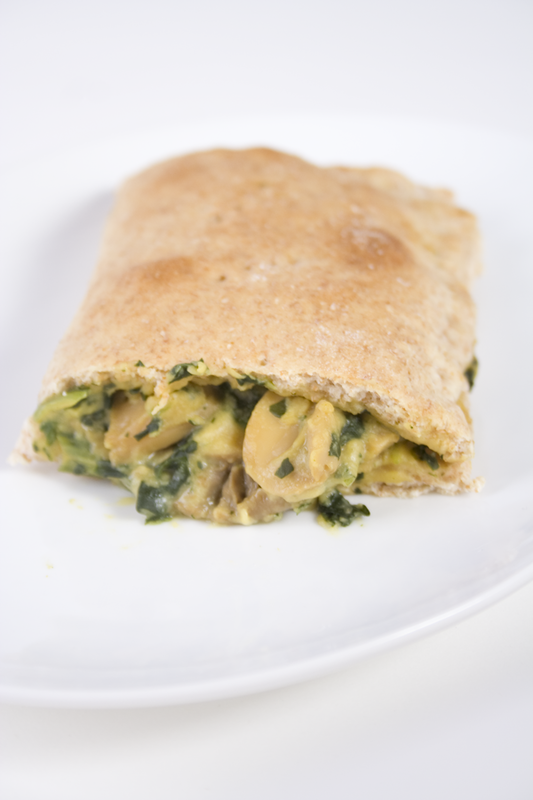 A healthy & vegan alternative to those frozen stuffed pocket meals. Want to know what others thought about this recipe? Would you like to comment on this recipe? Go to the Cheezey Spinach & Mushroom Pockets blog entry. Microwave spinach for 4 minutes. While that's cooking, in a saucepan add nutritional yeast, flour, onion flakes and salt. With a whisk mix this together and then add the rice milk and soy sauce. On medium heat stir with whisk until thickened. Drain spinach and mushrooms well and add to the mixture. In a mixing bowl add whole wheat, all-purpose flour, baking powder, salt, sugar together and mix together. Then mix wet ingredients; canola oil, vegan butter and rice milk together. Combine wet ingredients with the dry and mix together until well combined. Separate dough into seven evenly distributed pieces. Roll out on floured surface using a rolling pin into a roughly 7 inch square. I use a 7 inch square piece of paper as a template, cutting around the template with a knife. Keep in mind they don't have to be that perfect. Use the scrap trimmings to make the last pocket. Fill one side of the square with 1/4 cup of the filling leaving about an inch around the outside edges. Fold over and crimp with a fork around all open edges. Place them on a greased cookie sheet. Bake 10 to 12 minutes or until lightly brown on top. Let cool for 5 to 10 minutes before eating.